Brandkommando is a project that I have still not made up my mind about yet. Their material tends to be solid yet even out of their rather large body of work they haven’t released anything that strikes me as very memorable. This is a full-length release on tape once again nicely packaged by the excellent label Nil By Mouth. Side A demonstrates much of what I’ve come to expect from the project. Long winded tracks of chugging death industrial, or whirring hums with feedback layered on top. Very repetitive and droney sometimes to a fault. It’s good material but doesn’t show much progression from the project. Themselves… is the only track that really stands out with it’s sickly sweet synth harmonies and odd delivery. Things are a little more lively with the kickoff track to side B entitled Expansion. It combines mid-range synth pulses with moaning distorted vocals and deep bowel-inducing industrial hits. Asymetric Operation is another track that is a step above the rest here and provides for a decent closer. 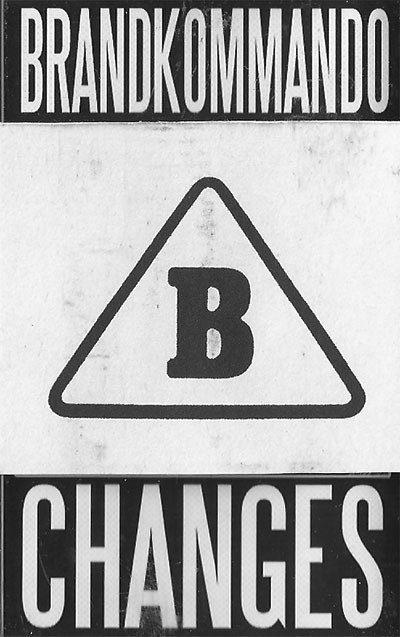 Changes is yet another chapter in the Brandkammando discography and one that doesn’t wander much from their previously established style. If you’ve heard their previous releases you definitely will enjoy this one. From my perspective, they’ve always been able to deliver solid material that can’t quite break the mold into that next level of effectiveness.